Yesterday, an Israeli Arab driver struck a palestinian school bus, killing 7 children and a teacher. An Israeli-Arab driver smashed his truck into a Palestinian school bus north of the capital on Thursday morning, killing at least seven children and a teacher, Palestinian sources said. Other reports put the death toll at up to 10, but this could not be verified at press time. An additional 36 children were injured when the bus overturned and caught fire, emergency officials said. Not all of the casualties were identified by Thursday evening. “They had very little time to escape the bus from the moment of impact. A fire broke out very soon afterward,” police spokesman Micky Rosenfeld told The Jerusalem Post at the scene. The driver, who is in an Israeli hospital, is to be questioned by police after receiving treatment. Palestinian Authority President Mahmoud Abbas announced three days of mourning, the traditional Muslim mourning period, in memory of the children who died. President Shimon Peres telephoned Abbas to convey his condolences. Peres asked the Palestinian leader to tell the grieving families that his thoughts were with them in their time of anguish, and assured Abbas that Israel would provide the best possible medical care to those of the injured who had been taken to Israeli hospitals. The bus had set out from a Palestinian school in Anata northeast of Jerusalem to the Ramallah area, for a day trip, carrying around 60 children. It turned around and headed back because of dangerous weather conditions. It was struck by the truck en route to east Jerusalem. Israeli and Palestinian emergency responders arrived and began evacuating the injured to Israeli and Palestinian hospitals. The bus was “completely destroyed” and littered with children’s shoes and backpacks, Dubi Weisenshtern, a volunteer with the ZAKA rescue and recovery organization, told the Post. “Anyone who is alive from that accident – it’s a miracle,” he said. Weisenshtern added that it was also a miracle that no children were trapped inside or underneath the bus. Ben Zion Oring, the head of ZAKA’s Jerusalem division, said it took emergency crews several minutes to determine the exact site of the accident, since it was located in PA territory. “I have been at a number of difficult events, but when you are talking about children the shock is that much harder,” he said. The accident took place just after 9 a.m. at the Adam Square, a major intersection north of Jerusalem between highway 60 and highway 437. Most of the injured children were taken to Ramallah area hospitals. Three injured children arrived by ambulance at Hadassah University Medical Center on Jerusalem’s Mount Scopus. In light of the serious burns they had suffered, they were transferred to the trauma unit at Hadassah’s Ein Kerem campus while attached to respirators and accompanied by a pediatricians and anesthesiologists. The injured children received initial treatment on site by medics from United Hatzalah and then were taken by Red Crescent and Magen David Adom ambulances to hospitals. The two Hadassah hospitals had been alerted about the accident and so had reinforced their emergency teams. General surgeons, pediatric surgeons, trauma and plastic surgery experts, lung specialists and others were called in. Two of the seriously injured reached the pediatric intensive care unit but were not immediately identified. The third, suffering from burns on a quarter of her body, was identified by her parents. Three other children, aged four and five, were admitted to the Mount Scopus hospital with light injuries. 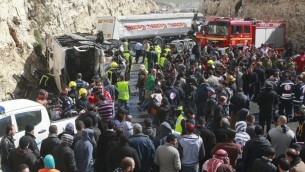 The truck driver was also taken to the Mount Scopus campus suffering from trauma and fractures. The Hadassah Medical Organization set up a special phone line to help relatives find their children; the center was manned by Arabic-speaking social workers. The hospitals were also in contact with the Ramallah hospital, where other injured were admitted, to help prepare a list of those hurt. In a press conference at the Palestine Medical Complex, PA Health Minister Fathi Abu Mughli said his ministry would not release the victims’ names until it completed identifying them. “The bodies are severely burned, which makes it harder to identify them, we are running DNA tests,” he said. Abu Mughli blamed the Israeli authorities for some of the deaths. “The IDF didn’t intervene the minute the accident took place. If it did, it could have saved some lives,” he said. Anata Mayor Ibrahim al-Rifai told the Post that the road where the accident took place is very dangerous. It is a three-lane road and there is no barrier separating opposing traffic. “There is a safer road that goes into Ramallah through the Beit El settlement. However, Palestinians are not allowed to use it, only some VIPs,” he added. Rifai also said that the IDF prevented some Palestinians from helping the burning children escape the bus before the ambulance arrived. A senior army source dismissed claims by Palestinian officials that soldiers prevented Palestinian rescue services from reaching the accident scene. The source said the military asked both Israeli and Palestinian police to come, and that paramedics directed emergency responders to the bus. The source added that within 30 minutes all of the wounded had been evacuated to hospitals and said that the IDF’s civil administration made every effort to assist the emergency services. MK Zevulun Orlev, chairman of the Knesset Committee on the Rights of the Child, announced that a special meeting will be held to discuss the accident and examine whether all safety regulations for school buses had been observed. This tragedy is very instructive in that it shows how 1) Israel did everything it could to help the victims and 2) the palestinians never miss an opportunity to blame Israel. It also shows how the other side will go out of their way to blatantly lie. A sickening accident and sickening attempts to exploit it as part of the demonization campaign against Israel. Abus accident Thursday that claimed 10 lives, nine of them schoolchildren, and injured 40 more turned into a political controversy when the Palestinian Authority Health Minister accused Israeli soldiers standing the near the crash of failing to assist rescue efforts in the minutes immediately following the crash. Channel 2 quoted Fathi Abu Mughli as saying that although several soldiers arrived at the site of the accident, they immediately returned to their posts rather than extending assistance. Now compare to the above comments of Anata Mayor Ibrahim al-Rifai, who claimed soldiers prevented Palestinian rescue services from reaching the accident scene. So which is it? Acting indifferent or actively impeding?